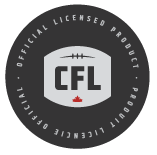 The Canadian Football League (CFL) has provided an Official Licensed Portal for prospective licensees to submit business information and applicable forms. This portal is ONLY for businesses that are interested in having the CFL consider their proposals for the licensing of CFL trademarks. Both steps listed below must be completed in order for the CFL Licensing group to consider an application. Please download and complete the Canadian Football League Licensing Application (PDF). Once completed, submit the filled-out PDF document by e-mail to licensing@cfl.ca. Submit the required $200 licensing application fee via the Licensee Application Fee form. Please note that this fee is non-refundable. Thank you for your interest in a partnership with the Canadian Football League. Only accepted licensees who meet the required standards will be contacted. Potential CFL licensees are not permitted to use any CFL properties affiliated with the League or Teams for commercial purposes. Such use will likely be treated as infringement of our rights and will result in legal action.